If you’re lucky enough to recognize it, there’s a particular excitement when you encounter an artist’s work as it’s entering a new phase. There’s of course the first order payoff, the new work itself to enjoy for the first time. With any luck there’s also a round of recognition for the new work, and with a bit more luck still, another round of notice for the work that’s come before. You might even get to say to someone, “Keep an eye on this. It’s going to be good.” So, don’t say I didn’t warn you: Janna Ireland is up to something. I say that in a giddy, can’t-wait-to-see-what’s-next way. In October, the LA Times ran a piece on her photographs of work by the late African-American architect Paul R. Williams, a series entitled, There’s Only One Paul R. Williams. They’re never less than remarkably observant, these images, and the best are reverent, awed, they approach the sublime. Ireland’s project is a long overdue reckoning with the work of a man who has been inexplicably – or for reasons all too easy to explain – downplayed. It’s also evidence that there’s only one Janna Ireland, and that she’s acutely aware – with Williams as a troubling object lesson – of how often America elides or downplays the contributions of its black artists (yes, I am once again thinking of Charles Wright). And so, her work could someday fall victim to that tradition, but it won’t be for lack of commitment to her craft, or lack of vision. A great obstacle for many artists is trust – in the artist-self, in the work, and in the audience to approach that work in good faith, in the audience to acknowledge that it’s restraint that’s so often the most seductive aspect of the works we return to time and again. That restraint means the artist must avoid over-explanining, avoid simplifying or making the finished product too pat, too polite. Either Janna Ireland has a great poker face, or she’s weeded these moments out of her work. Ireland’s series Objects for Women, for example, is a carefully curated series of images, offered without commentary aside from a single line: “Some things designed with ladies in mind.” They range from Hanes socks to Hermes scarves, each presented on a gilt, mirrored tray. She’s written elsewhere that her work is frequently concerned with “domesticity, isolation, black identity, and the performance of femininity,” and it’s not hard to tease out ideas around some of those matters from the Objects series. She refrains, though, from stepping in and elaborating on them. In Visual Spells, she does something similar, presenting a series of three black and white images beneath the title and a single line of text reading, “A short mystery.” It feels more playful than Objects, but look again: does it? There’s ambiguity enough to command repeat viewings. Ireland doesn’t lack for trust in herself, her work or her audience. And restraint? “No steel can pierce the human heart so icily as a well-placed period,”the writer Isaac Babel said. If anything, I might complain that Ireland’s restraint hasn’t allowed for a maxim like Babel’s to account for the often peculiar yet somehow wholly appropriate framing of many of her shots. A primary order of business here is making the case that Janna Ireland has a remarkable eye and admirable technique behind the camera. What you may notice is that, unlike many photographers, she has a magnetic presence in front of it, as well. Her repeated presence in the series of photos that make up The Spotless Mirror is compelling. The same is true of Night Season, which, though it’s her earliest public work, contains some of my favorite images among her body of work so far. Across the span of her work so far, we see her full face, a direct gaze in some pictures, a more oblique angle in others, and she shows up hidden in shadow, shrouded in fog or turned away entirely in others still. But her uncanny sense of how she might balance or unbalance the frame with the incline of her head, her posture, or the fluidity of her movement is a quietly powerful element. She mentions black identity as an ongoing concern in her work, and it’s not hard to read, for example, both her elegance when featured alone or with her husband, and the dressed-down moments with her children as statements of dignity, or simple exertions of her right to be as an artist, woman, wife and mother in 2018 America. Right now, I’m reading City of Quartz, Mike Davis’ incredible social history of Los Angeles. City of Quartz was recommended to me about 7 years ago, when I moved to LA. I borrowed it from the library right away, but never found time to read it. It’s been on the top of my reading list for all these years. Now, I have two toddlers and I definitely don’t have time to read it, but I’m squeezing it in,anyway. I’m obsessed with Los Angeles, and it’s time to really do my research. I think it’s a good thing that I waited; I understand LA and its history a lot better now than I did 7 years ago. City of Quartz is so layered that I’m glad I’m going into it with more context. The writing is wonderful–sharp and dryly funny–and I pause every few pages to take note of a movie I should watch or a book I should read. I got myself a big stack of photo books for my birthday this year, and I keep returning to a few of those–in particular, Nina Berman’s An Autobiography of Miss Wish, Lyle Ashton Harris’ Today I Shall Judge Nothing that Occurs, Sam Contis’ Deep Springs, and Deanna Lawson’s new self-titled monograph. Berman’s and Harris’ books make really deft use of archival material to tell individual stories,and Contis’ and Lawson’s books are both just page after page of stunning photographs. Janna Ireland appears at Schindler House in West Hollywood on December 13. 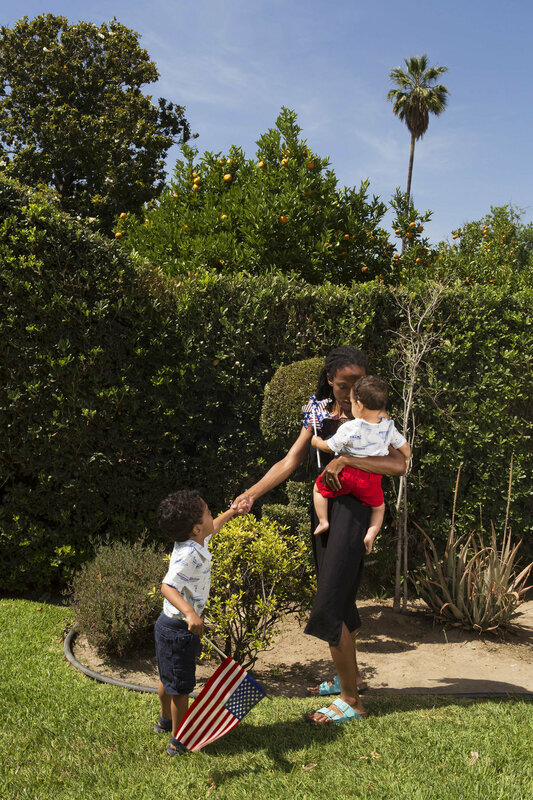 Photographer Janna Ireland, in collaboration with the Southland Institute, will discuss intersections of photography, architecture, motherhood, race, domesticity, portraiture, class, and documentation in four bodies of work about Greater Los Angeles. Ireland’s interest in architecture began with West Hollywood (2012), a series of black and white photographs capturing pockets of stillness and isolation amidst the buzz of the city. Two years ago, Ireland began researching and photographing the buildings of Paul R.Williams, the legendary Angeleno architect who, over the course of a 50-year career, designed more than 2000 buildings. These photographs, part of an ongoing project, were exhibited last winter at Woodbury University’s Hollywood gallery in There Is Only One Paul R. Williams, curated by Andrea Dietz and Audrey Landreth and organized by the Julius Shulman Institute. Janna Ireland was born in Philadelphia, but has chosen Los Angeles as her home. She holds an MFA the from UCLA Department of Art and a BFA from the Department of Photography and Imaging at NYU. She currently teaches photography at Pasadena City College. Ireland is the 2013 recipient of the Snider Prize, presented by the Museum of Contemporary Photography, Columbia College Chicago. Earlier this year, she was named a Cultural Trailblazer by the Los Angeles Department of Cultural Affairs. Her work has been shown in solo exhibitions in Los Angeles, San Francisco, and Chicago, and in group exhibitions across the United States and internationally. She has been published in Aperture, Art Papers, Vice, and The Los Angeles Times. The Southland Institute (for critical, durational, and typographic post-studio practices) is dedicated to exploring,identifying, and implementing meaningful, affordable, sustainable alternatives in art and design education in the United States. At its core are an unaccredited postgraduate typography workshop and evolving public online repository of educational resources, built around the tools, processes, histories, and discourses of typography, design, and critical art-making. It is also a forum for inquiry into the processes, potentials, and complications of higher education and its attendant structures and systems.